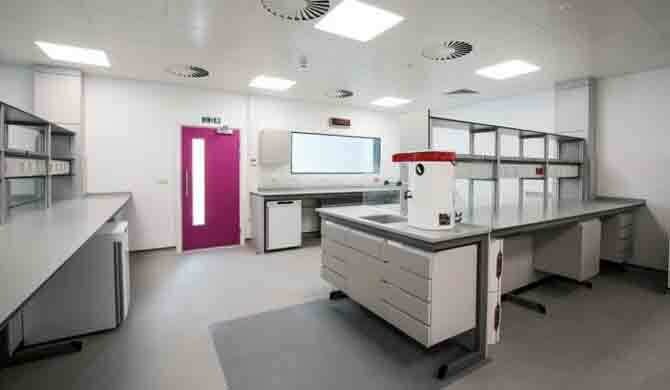 The c£8M project involved a full strip-out and refurbishment of the existing laboratory building to create a new laboratory facility comprising 3no large Containment Level 3 (CL3) laboratories, a pressure cascaded PCR suite, wet laboratories, tissue culture rooms, and chemistry and biology labs. The high specification, technical fit-out included fume cupboards and microbiological safety cabinets. Systems included the usual mechanical, electrical and public health systems but also process water of varying purity levels, gas systems and compressors. Our appointment covered RIBA stages 1 to 7, with design duties up to RIBA Stage 4 followed by client-side M&E monitor.